Florida Power & Light (FPL), which said “no” two weeks ago, has now agreed to pay Indian River County nearly $300,000 to prepare emergency responders to serve its proposed power plant in Okeechobee County, even though Okeechobee County has legal first-response duties. Much of this progress on fighting Florida Power & Light’s power plant payments can be placed on Tim Zorc, Indian River County District 3 Commissioner. Tim Zorc made the argument for the payments at the April 5 county commission meeting, which was attended by FPL representatives. Zorc said county taxpayers should not bear the costs of protecting a power plant outside the county. 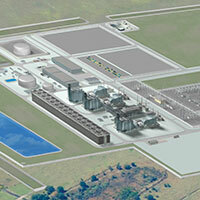 Providing protection, Zorc said, will stretch the county’s coverage area and resources and require training staff to respond safely and effectively to problems at the huge $1.2 billion natural gas-fired plant. The biggest concern, Tim Zorc said, besides keeping IRC taxpayers from paying to protect the power plant while Okeechobee County receives the benefit of FPL’s property taxes, is lack of familiarity with servicing a facility of this kind.